Inadequate or incomplete testing of integrations between your SumTotal LMS and your other systems can create problems, it can take weeks or months to correct. Testing is the most critical phase of connecting your systems. An efficient testing process helps you identify defects and fix them in a risk-free environment before you deploy them to your users. Avoid the risk of bad data. 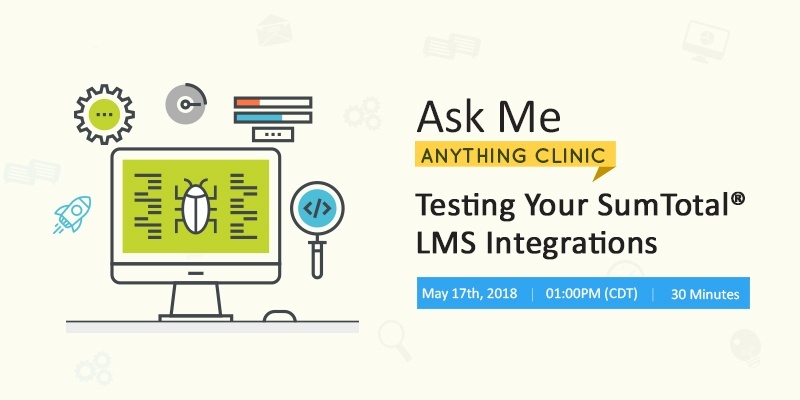 Join our free Ask Me Anything Clinic on Testing your Sumtotal Integrations and learn how to avoid the risk of inadequate testing. What do I need to include in my test plan? What are the most critical use cases and how do I build and deploy testing scenarios? What are the prerequisites for integrations testing? What is the right approach to integrations testing for my organization? Learn how you can ensure a smooth data flow between your Sumtotal LMS and other applications. Register now to submit your questions.